Xiaomi have launched a new phone which is Mi3 and Mi 3 smartphone got out of stock in the Indian market. While 10,000 units were sold-out in 5 seconds on July 29; 15,000 units took just two seconds to get out of stock earlier today. Both Xiaomi and e-retailer Flipkart have confirmed this time on their social-media channels along with the date for next schedule sale, which is August 12. The e-retailer had earlier revealed that over 150,000 Flipkart users had registered for the latest sale. Priced at INR 13,999 and 230$ USD, Xiaomi Mi 3 is getting a lot of attention from the consumers. The phone is an excellent value-for-money as it comes with 5.-inch full HD display, Snapdragon 800 quad-core processor, 2GB of RAM, Android 4.4.2-based MIUI and 13MP rear camera. 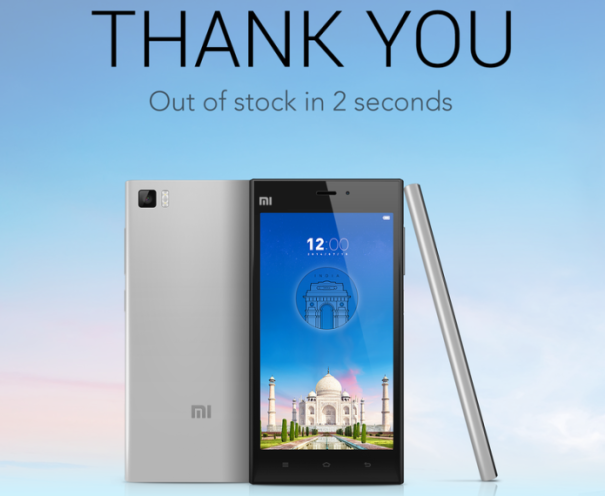 To remind you, Xiaomi Mi 3 was originally launched on July 15 in the country and has seen three flash sales till date. In related news, Xiaomi has rolled-out a new software update for the Mi 3 in the Indian market.